This time of year puts me in mind of songs about autumn - this morning, for some reason, the old Led Zeppelin tune ‘Ramble On.’ Lyrics like ‘Now it’s time for me to go, the autumn moon lights my way’ just seem to fit the mood of the garden. Wandering around the yard, I see such interesting things, signs of change. 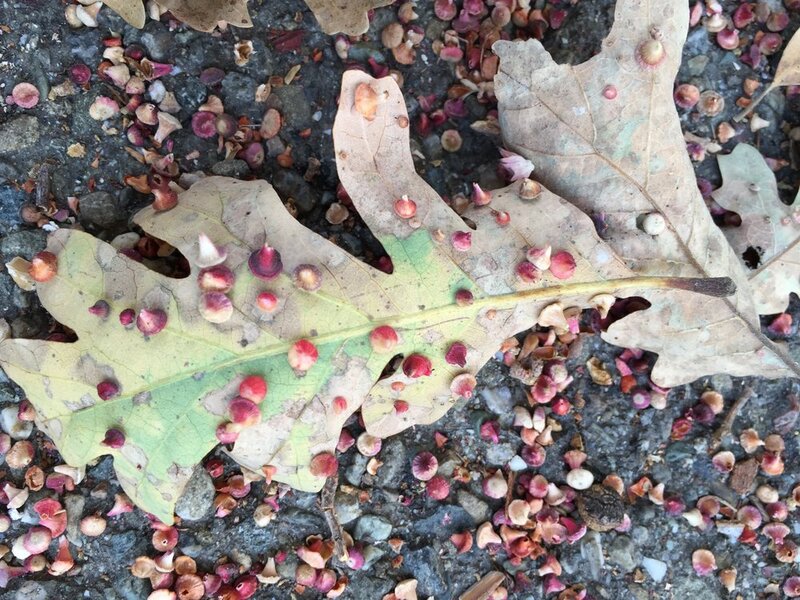 The gall wasp population exploded this year on our Valley Oak (Quercus lobata), and now that the galls have served their purpose, they are falling from the leaves like rain. When you stand under it, you are in a shower of galls. Our driveway is red with them. The chickens have mostly stopped laying for the winter - between the annual molt and the shortening days, we are lucky to get an egg every once in awhile. The garlic is sprouting, the kale and cauliflower and lettuce are growing beautifully, but something has eaten all of the kohlrabi and beets, and my spinach won’t germinate. I’ll just keep seeding and planting on through, until frost. Fall flowers are still blooming like crazy and the pollinators are frantically bringing in all they can - you can feel the urgency. I noticed the honeybees bringing in bright orange pollen and wondered where it was coming from, and then I saw one collecting pollen from a Tithonia blossom and realized that was the source. We’ve been eating a good fig crop, and the olives are starting to change color. We won’t harvest them till December or January. We have a month or two yet before the flowers succumb to cold weather (our days are still in the 80’s, and we’ve only reached nighttime lows in the 40’s a couple of times; our first average frost date is December 15). I spend a good amount of time grooming the brassica leaves, picking off cabbage butterfly worms and eggs. It’s not fun, but it’s satisfying, and the chickens love to eat the worms. They do quite a bit of damage to the leaves of all my cruciferous crops, but the cabbage is looking the worst right now, and I’m hoping it pulls through. The row covers help, but do not entirely deter critters (see earlier note about ravaged kohlrabi and beets). Soon I will begin the daily task of raking leaves and adding them to the chicken run. We are desperate for rain, but none is forthcoming. White bean, pancetta, and chard pot pie, a sure sign of fall. You can find the recipe at Smitten Kitchen. A reminder: It pays to be a messy gardener this time of year; many pollinators and other insects overwinter in leaf litter and mulch. So rake up some leaves for your compost (or chickens), but leave a good amount where they fall, to help keep a healthy habitat for those little guys. What does your garden look? Have you had snow where you live?